A Nov. 28 meeting between President Trump and New York Gov. Andrew Cuomo (D) (seen above) produced positive headway on a number of infrastructure-related efforts, including the stalled Gateway Project, though the price tags for such efforts remained the main stumbling block in their conversation. “I think it’s fair to say that the meeting was a positive meeting. I think it’s fair to say that the president was receptive to what we were talking about and the president said that he wanted to take the next steps to find a way forward,” Gov. Cuomo noted in a transcript provided by his office. 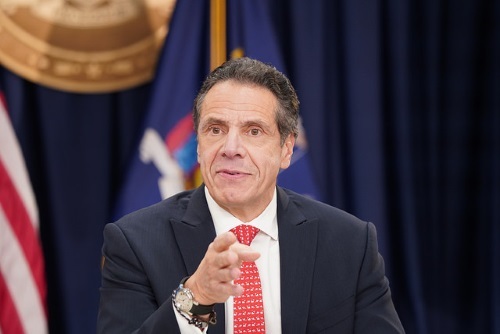 “The next steps would include working with the federal government, primarily the Port Authority working with the [USDOT], to find out how we could get to the bidding process and give bidders the security to know that this is a project … worth their time and investment to come up with bids so we have certainty to what the ultimate financial exposure is,” he said. Gov. Cuomo said the meeting came about in part due to an October video (see below) he sent to the president highlighting the deteriorating condition of the Hudson River railroad tunnels. While he discussed other infrastructure projects with President Trump – the redesign of LaGuardia airport, for one – the governor said the Gateway Project and the Hudson River rail tunnels were the focal point of their meeting. “The Gateway project … is really the construction of an entire corridor,” Gov. Cuomo noted. “It’s a $30 billion project because it has a number of projects” grouped together, including railroad bridges, trains stations, and tunnels. The most urgent need, however, is the Hudson River tunnels because they have the longest lead time, he stressed. Left to right: Melissa DeRosa, secretary to the Governor; Gov. Cuomo; Richard Cotton, executive director of the Port Authority of New York and New Jersey. He said that since those tunnels are owned by Amtrak, “the federal government should pay 100 percent because the federal government owns them. The president was rightly concerned with the question of how we would do this,” especially as Amtrak has estimated the cost of building new tunnels at $13 billion.